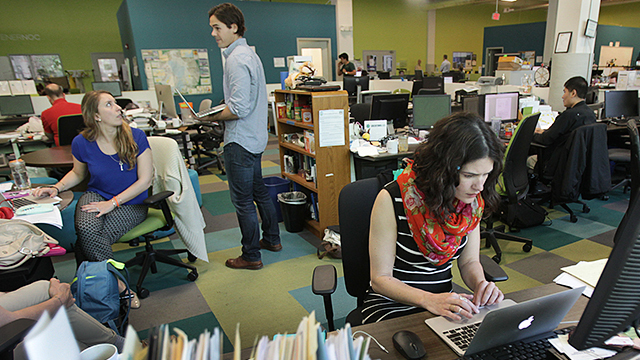 Millennial workers, those ages 18 to 35, are just as likely to stick with their employers as their older counterparts in Generation X were when they were young adults, according to recently released government data. And among the college-educated, Millennials have longer track records with their employers than Generation X workers did in 2000 when they were the same age as today’s Millennials. Every two years the U.S. Department of Labor collects data on how long workers have been with their current employer as part of the Current Population Survey. Though the data have been collected periodically since the early 1950s, the present tenure questions began in 1996, so we can only compare Millennial workers with Gen X workers when they were the same age. These college-educated Millennials are sticking with their jobs longer than their Gen X counterparts. About 75% of college-educated 25- to 35-year-olds (75% for men and 74% for women) had worked for their employer at least 13 months in 2016. Back in 2000, somewhat fewer college-educated Gen X women (70%) had been on the job that long. Among college-educated Gen X men, 72% had similar tenure. The increasing job tenure of college-educated Millennials is consistent with a decline in employer switching among all working-age adults since the 1980s. The reasons for the decline are not well understood. Recent research indicates that the rise of dual-career households, the decline in middle-skill jobs, occupational licensing and the need for employees to retain health insurance cannot account for much of the decline in job-switching. 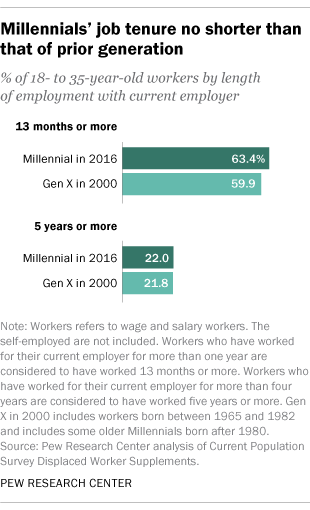 The longer tenure of college-educated Millennials compared with that of Gen X workers does not necessarily translate into higher wages or more job security. They may be sticking with their current employers due to a dearth of opportunities to get a better job with a different employer. But, in any event, their reported tenure makes clear that the “job-hopping Millennial” characterization does not fit the broad Millennial workforce. The trend is different among less-educated young adults. For example, among Millennials with a high school education, 70% of men and 69% of women had been with their employer at least 13 months. These proportions are similar to their high-school-educated counterparts among today’s Gen Xers in 2000 (72% for men and 71% for women).